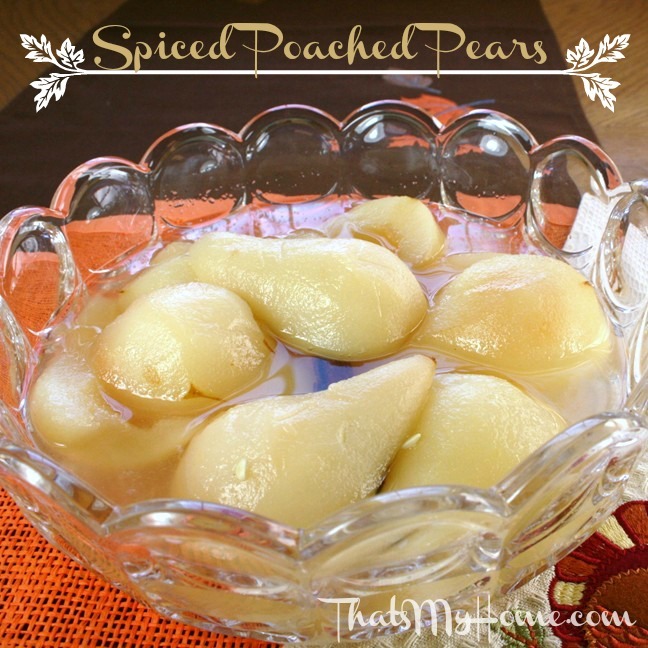 Spiced Poached Pears Recipe, A Taste of Fall! Bosc pears poached in a lemony cinnamon syrup, cooked until just tender. This spiced poached pears recipe has to be one of the best flavors of fall. I got lucky and ran into the best sale the other day. I got 3 lbs. of pears for 69 cents a bag! I bought 5 bags of them and now am looking for ways to use them up before they spoil. Poached pears has long been one of my favorites, you can flavor them anyway you like, today I used lemon and cinnamon sticks. I almost went with vanilla spiced pears but needed to use the lemon up I had first. The lemon actually serves 2 purposes, one for flavoring but the second one also keeps the pears from turning dark so it was a win, win. Add 3 cups of water to a large saucepan. Add the sugar and stir until dissolved over medium heat. Add the cinnamon sticks. Cut the lemon in half and squeeze the juice into the liquid. Throw the rinds in the pan. Add the dash of salt. Add just enough additional water to cover them. Cook over low heat until pears are tender, about 20 - 30 minutes. Remove from heat and cool. Refrigerate. « It’s Soup Weekend at Recipes, Food and Cooking! Coming from the Ugly Duckling Party, these look delicious! I think pears are had to make look pretty because think about it…their skin is not vibrant and smooth and pretty as an apple and when you peel them, well they are plain pale, lol…like a pair of legs the first day of summer after a long winter!!!! lol…Thanks for sharing, the recipe it’s yummy though! I came over and posted ugly tonight. LOL I have quite a few of those pictures and I usually won’t share them even though it is delicious. Thanks for sharing this at The Ugly Duckling this week! Wow, these are beautiful and they sound totally delicious! Pinned to my cooking bucket list. Stopping by from the Ugly Duckling Party. I totally missed the ugly duckling party concept so I came back and shared one tonight. I have a bunch of them so look forward to another party and will post the ugly but good ones. Thanks for hosting. wish I could share them with you! Oh yum! I have never tried poached pears. Always wanted to! Thanks for sharing with SYC.